The emission produced by accretion onto supermassive black holes in AGN dominates the overall emission of the universe over almost all of the electromagnetic spectrum, particularly in the far UV and soft X-ray regions where the power from most AGN peaks. The emission from AGN can vary on timescales as short as a few minutes, implying extremely small emission regions. However, as yet, we know little about the structure of these emission regions, about the mechanisms by which the emission is produced or about the relationship between emission in different wavebands. For example, does varying X-ray emission drive variability in the optical band and, if so, why? The study of variability is therefore crucial to our understanding of the true nature of AGN and hence has become one of the major areas of international research and collaboration. 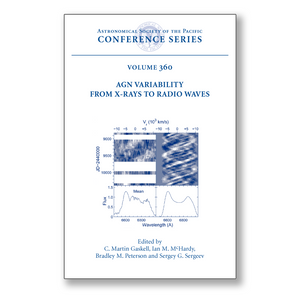 The meeting "AGN Variability from X-rays to Radio Waves" brought together researchers from around the world to consider the nature, causes, and many implications of AGN variability.